Society’s growing concerns about nutrient management issues, and particularly the impact on water quality, will require changes in the way farmers operate and their accountabilities. Agronomic Technology Corp (ATC) today announced the launch of its Agronomic Advisory Council, focused on using big data and science-driven technologies to drive profitable sustainability on the farm. Dr. Jim Budzynski: Managing Principal of MacroGain Partners, former principal at BrightPath Capital, and well known strategic advisor to the agribusiness sector. Bruce Knight: Founder at Strategic Conservation Solutions, former Under Secretary for Marketing and Regulatory Programs at USDA and former Chief of the Natural Resources Conservation Service (NRCS). Ed Schafer: Interim University of North Dakota President, twice elected Governor of North Dakota, and former United States Secretary of Agriculture. Rick Tolman: Former Chief Executive Officer of the National Corn Growers Association (NCGA) and executive at the U.S. Grains Council. 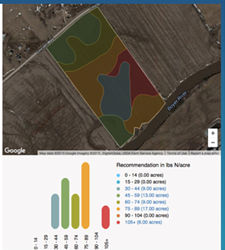 Agronomic Technology Corp provides decision support tools for agronomists and agricultural enterprises, and is best known for its Adapt-N nitrogen management software. Adapt-N is the leading independent nitrogen management solution -- having launched in 2008 and now operating in 35 states -- and is working with diverse partners including large agricultural retailers, Walmart’s sustainability initiative, land management companies, crop input suppliers, and agricultural software systems. Adapt-N has shown the ability to help growers improve yield while reducing nitrogen loss, as was recently verified in the new NutrientStar independent evaluation program. Dr. Jim Budzynski is the Founder and Managing Principal of MacroGain Partners, and has over 30 years of direct agrifood and related markets experience. He is a well-known strategic thinker in the U.S. agri-business sector, counseling both start-ups and major multinationals. He was a principal with BrightPath Capital, a private equity firm focused on the agrifood space, and spent 12 years with Monsanto Company in a variety of product management, marketing, and strategic planning roles. Bruce Knight is Principal and Founder at Strategic Conservation Solutions. He is a nationally recognized expert on conservation, agriculture and the environment. Knight was the Under Secretary for Marketing and Regulatory Programs at the U.S. Department of Agriculture (USDA) from 2006-2009. From 2002 to 2006, Knight served as Chief of Natural Resources Conservation Service, the lead USDA agency for conservation on private working agricultural lands. Ed Schafer has extensive experience and proven performance in both business and government. He was elected Governor of North Dakota twice and served as United States Secretary of Agriculture. He has led a multinational consumer products business and several entrepreneurial start-up companies. Schafer is currently serving as the Interim University of North Dakota President. Rick Tolman spent 14 years as Chief Executive Officer of the National Corn Growers Association (NCGA). Prior to joining NCGA, Tolman worked 18 years for the U.S. Grains Council. Tolman has served on the Board of the Waterways Council, Inc, on the Executive Committee of the Field to Market Sustainability Group, as Co-Chair of the U.S. Biotech Crops Alliance; and Co-Chair of the Coalition for Safe Affordable Food. Agronomic Technology Corp provides a recommendation platform to help tackle key challenges in agriculture. The company leverages the power of cloud technology, proven science and data to deliver large-scale, field-specific solutions that break the tradeoff between financial and environmental performance. The company operates Adapt-N, the leading independent nitrogen management solution that was launched in 2008 and operates in 35 states. It is the only major nitrogen modeling tool that is independent, backed by 10+ years of land grant research and with published, peer-reviewed research of efficacy.